A first-of-its-kind website and corresponding service was rolled out on Thursday by CTIA - The Wireless Association with an intent to inform mobile device users about app data use and their impact on wireless data plans. 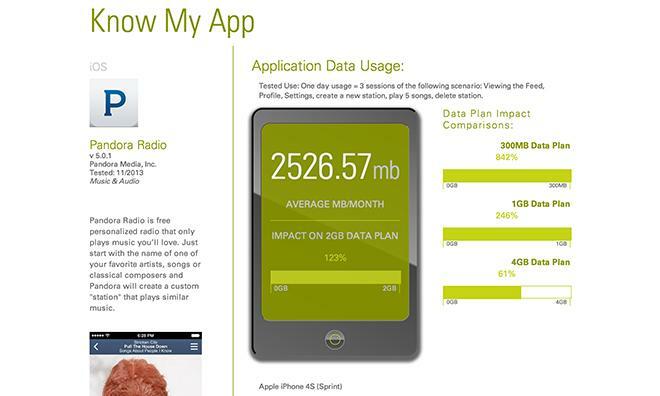 CTIA's KnowMyApp.org website allows users to estimate an app's data usage before they download, a service that is likely welcome to those with pricey wireless contracts, reports PCWorld. While tools capable of measuring an app's data use after downloading have been around for some time, the new site is the first to offer estimated information prior to download, according to CTIA. Users visiting the site can search for specific apps to find estimated data use and impact to data plans ranging from 300MB to 4GB per month. For example, music streaming service Pandora for iOS showed an average use of 2526.57MB per month, which represents 842 percent of a 300MB plan, 246 percent of a 1GB plan and 61 percent of a 4GB plan. In this particular case, the testing system estimated one-day usage as a compilation of three sessions, each including the following actions: "Viewing the Feed, Profile, Settings, create a new station, play 5 songs, delete station." Created by CTIA's Application Data Usage Working Group, which includes industry giants Apple, Microsoft, and all three major U.S. wireless carriers, among others, KnowMyApp was developed by product testing and certification firm Intertek. In practice, the tool generates app information by testing against a benchmark that taps into AT&T's Application Resource Optimizer, a diagnostic system that tracks network data. Currently, the site is limited to the top 50 free and paid apps on Apple's iOS App Store and the Google Play Android app store. In addition to the app-specific information, users can learn about general data use and conservation. CTIA said KnowMyApp also looks to help developers create more efficient apps and invites them to submit their wares for testing via Intertek Testing Services.